The location of these apartments is great - right on the slopes opposite the Golf ski lift. The little Spar shop was minutes away and a good rental shop provided us with Nordic skis for a day's trial and lesson. The beds were very comfy - the kitchen small but well equipped. The rooms were always warm and it was easy to dry ski clothes out. The boot lockers were right next door and at night it was blissfully quiet compared to noisier Meribel Centre where we have stayed several times before. We all enjoyed the spa and pool - although it was inevitably busy at the end of the day. We liked the ambiance of Meribal Village - less frenetic than its bigger neighbour and less through traffic but easily reached by the frequent and punctual buses. Location is excellent. Meribel village is lovely with baker’s ski shop , small SPAR supermarket, and two restaurants and very lively bar. 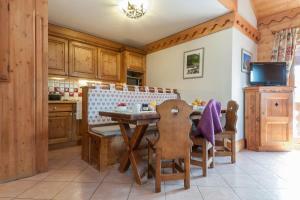 Lift is short walk from apartments and also free bus to meribel central where ski schools meet. Swimming pool and spa facilities very good and very nice reception area in main building. 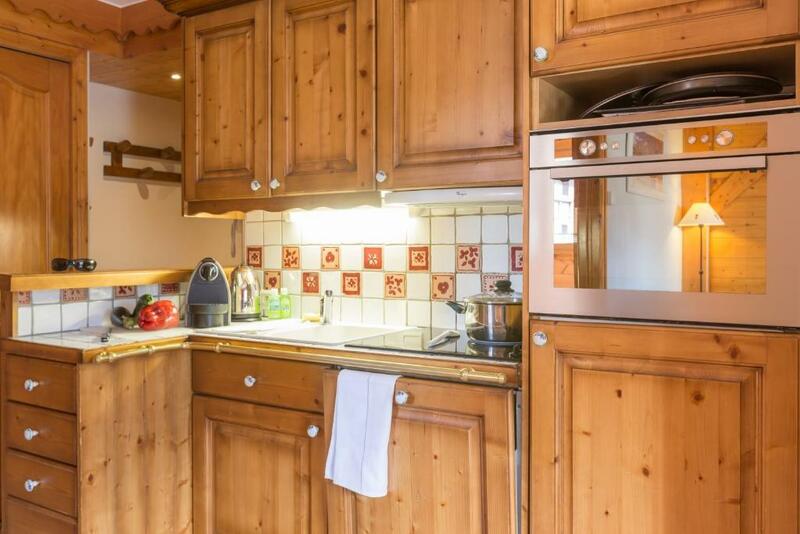 Very well equipped kitchen (although lack of space for preparing food) . Nice terrace with lovely view of mountain . Good free parking right outside the apartment (more convenient than covered parking which you pay for) . Staff very helpful. Good price compared with other accommodation in Three Valleys especially given location . Great Location, nice lobby, close to the slopes. The kitchen had all the necessary equipment, even a Nespresso coffee maker. The apartment was clean, the beds made, the cleaning kit was provided. 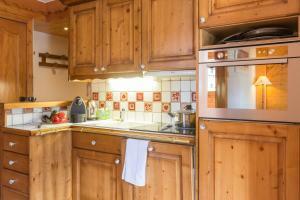 Friendly receptionists, swimming pool in chalet B, close to the supermarket and ski rental. This was the best apartment I've stayed in in a French ski resort. Previously, apartments that said they slept five were cramped with two people in them. This is completely different. You could sleep four comfortably in the two bedrooms and it would be OK with another on the sofa bed. The shower was good with plenty of hot water at peak times. Nice bathroom and decent kitchen facilities. The pool is great and the steam rooms and saunas were lovely after a day's skiing. The exit from the ski locker room was less than 100m from the lift. The Spar shop, a great apres bar and a nice traditional Savoyard restaurant are also only about 100m away. The apartments are in a great location for the skiing, very close to a quiet but speedy 4 person lift that gets you up to the lifts serving the wider Meribel area or Courcheval very quickly. Skiset ski hire for those needing it across the road, alongside a well stocked, yet very small Spar supermarket and a small but very good bar and restaurant. Buts that's it for whats local, for everything else you need to travel into Meribel centre a 10min drive. There is free outdoor parking that still seemed to have spaces even during half term. Staff were friendly and helpful. Underground parking was a great fascility too. Liked the access to ski lift and the pool/sauna/steam room. Well described and a great place to stay just before Xmas. Access to the slopes via ski lift and a nice small village. Eating out in the evening somewhat restricted but bus service or use of car makes Maribel easily accessible. We were very fortunate with the weather and this always influences your views! . 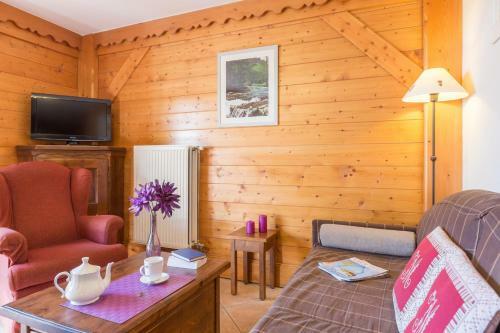 One of our top picks in Méribel.Résidence Pierre & Vacances Premium Les Fermes De Méribel is located in the center of Méribel Village, 3.1 mi from Méribel and just 350 feet from the ski elevators. It offers fully equipped apartments and an indoor, heated swimming pool. All of the apartments at Résidence Pierre & Vacances Premium Les Fermes De Méribel have a bathroom, TV and a private balcony. Bed linen and towels are also included and beds are made upon arrival. Free WiFi access is provided throughout. During winter, there is a shopping delivery service available at an additional cost and the bread and pastry delivery service allows you to order your in–room breakfast the night before. After lunch, guests can enjoy board games, books and borrow a portable PlayStation. Upon prior reservation and depending on the date of the stay, guests can benefit from reduced rates for ski passes and equipment rental. In addition to the indoor, heated swimming pool guests enjoy free access to the fitness room, sauna, steam rooms and relaxation room. The Deep Nature Spa provides made to measure massages, exfoliation treatments and other facial and body treatments, at an additional charge. 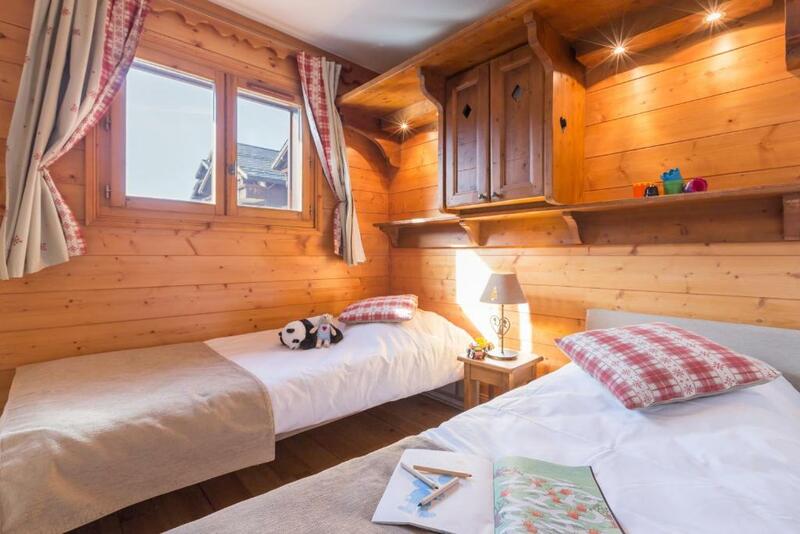 Résidence Pierre & Vacances Premium Les Fermes De Méribel also has a game room, a fire-side lounge and a tea room. A free shuttle is available to go to Méribel's center. 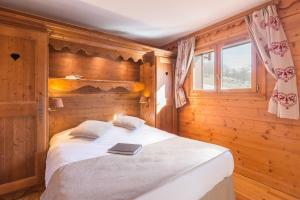 When would you like to stay at Résidence Pierre & Vacances Premium Les Fermes De Méribel? This apartment features a living area with 1 single sofa bed and one alcove with 2 bunk beds. There si one bedroom with a double bed. Beds are made prior to arrival. It has one independent bathroom with a bath. The fully equipped kitchenette opens on the living area. This apartment features a living area with a single sofa bed, one bedroom with a double bed and one bedroom with 2 single beds. Beds are made prior to arrival. It has one independent bathroom with a bath or a shower. The fully equipped kitchenette opens on the living area. This apartment features a living area with a single sofa bed, one bedroom with a double bed and 2 bedrooms with 2 single beds. Beds are made prior to arrival. It has 2 bathrooms one of which has a bath and the other has a shower. The fully equipped kitchenette opens on the living area and has a Nespresso® coffee machine. This apartment features a living area with a single sofa bed with one pull-out bed, one bedroom with a double bed and one bedroom with 2 single beds. Beds are made prior to arrival. It has one independent bathroom with a bath and a shower. The fully equipped kitchenette opens on the living area and has a Nespresso® coffee machine. Full WiFi access is included in this apartment. This large apartment features a living area with a single sofa bed, one bedroom with a double bed and 3 bedrooms with 2 single beds. Beds are made prior to arrival. It has 2 bathrooms one of which has a bath and the other has a shower. The fully equipped kitchenette opens on the living area. House Rules Résidence Pierre & Vacances Premium Les Fermes De Méribel takes special requests – add in the next step! Résidence Pierre &amp; Vacances Premium Les Fermes De Méribel accepts these cards and reserves the right to temporarily hold an amount prior to arrival. Résidence Pierre & Vacances Premium Les Fermes De Méribel accepts these cards and reserves the right to temporarily hold an amount prior to arrival. After booking, you may reserve the location of your accommodations by calling the residence. Location preferences are subject to availability and available at an additional cost. Price includes : Bed linen, towels, household linen , a cleaning kit, 2 bathrobes, end of stay cleaning (excepted dishes and kitchen corner), Hammam and/or Sauna. Please note that free limited WiFi access is available for up to 5 devices. Unlimited WiFi access is available upon request and at an extra charge. A baby kit, suitable for children under 2 years weighing less than 15 kg, is available free of charge (subject to availability). The kit includes: 1 cot, 1 high chair for infants from 6 months old, 1 changing mat and 1 pushchair. I was prepared from having read other reviews for very small apartments. The bedrooms are compact but fine for a week's holiday. The living area was really tight when we had all our party together (7 of us - but we rented several apartments which proved a good decision). There was no oven - only a microwave combi which was not that effective and so we cooked on the hob which worked well. The apartments are sadly looking a little battered - they need a really good deep clean and some redecoration. I wonder what the impact of the new PV building in M'bel Centre will have on them. The bathroom had mould and was unattractive stains ard the loo area. Myt only major criticism is the Reception area - run by charming, hard working staff but totally overrun at times...we arrived tired and keen to settle in. There was one person on duty and a long protracted wait ensued. Not professional and a bad start however well meaning staff were. Finally - the wifi signal was poor and my husband had great difficulty making calls on and off wifi to the UK. Overall, we were there to ski and had a wonderful and very happy week and would happily return to PV but do feel that some investment should be made in updating the apartments and providing better services. Apartments much smaller than they appear in the photos. We had a six person apartment (2 bed) for 4 adults , and was only just big enough. Lounge area is small and bedrooms very small. Terrace needed sweeping when we arrived . Furniture a bit tired . Bad internet connection. Very old style to ask money for internet acces. I only see this in France unfortunately. The apartments look very big and comfortable on the website, but are really tiny. The bathrooms are very small, build for tiny french people I guess. No value for money! The apartment size and layout was a disappointment. The main bedroom was tiny with an awkward slanted wall that left a gap of 10 cm between the wall and the corner of the bed, which made it tricky to get to my side of the bed. The children's bedroom was also small but OK, however the layout wasn't great either. The access to the built in wardrobe was obstructed by the bed, the cabinet above the other bed was so small my daughter banged her head at night! I expected more for EUR 3240. But then again it was the half term week and France is expensive. Overall it was great but having to pay €15 to use the safe was a bit stingy. There was no spatula utensil to flip or remove fried eggs from the pan. It's a shame there is no hot tub in the spa. However these are minor gripes in an otherwise excellent property. the rooms were shabby, and cluttered. the apartment was only big enough for two people. Generally awkward access to apartment - too far to car park. Certainly not superior as described. Lack of instructions for kifchen equipment. Basically the apartment was far too small. The apartments are getting tired and worn. Small too compared to others we have had from the same company in the past. The pool was cold. Reception is very hard to find when you first arrive (its at the rear of Block A). The beds were very uncomfortable. What is in the village is good, but there is virtually nothing there other than the apartments, 3 shops, 1 Bar and some chalets, so virtually no Apres Ski if that's important to you. Too small to have a sofa bed in front room - should be max 4people in that size room with 2 in each bedroom. It was too tight for 2 adults and 3 children let alone sleeping 6 which it says it can. Pool was cold. Very minor issue but only 2 dressing gowns were provided when there were 3 adults - it would have been better to not provide any or provide enough for all adult guests.